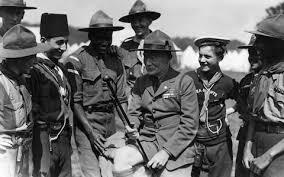 In 1910, Lord Baden-Powell, founder of Boy Scouts, created Sea Scouts to serve as an extension of Scout training. Young men would develop personal character—pluck, patriotism, and intelligent discipline—through a sense of duty. By teaching boat management and seamanship, young men would also gain individual knowledge to help them become self-supporting. Sea Scouts performing coast guard duties, lifesaving and salvage at wrecks would also perform invaluable community service. Baden-Powell’s belief that Sea Scouts would combine the best attributes of seaman- ship with training in character was shared by the Boy Scouts of America. Two years after the Boy Scouts of America was born, Sea Scouts was organized in the United States with the aid of the Secretary of the Navy in 1912. The Sea Scouts have been co-ed, proudly, since 1972. A full history of the Sea Scouts may be found here. Most ships hold formal meetings conducted in either full dress or work uniforms. Swimming, lifesaving, first aid, Coast Guard Auxiliary Sailing and Seamanship, and cardiopulmonary resuscitation courses are taught with the ship by their own youth officers or other adult mentors. The state safe boating course is also offered to their members by many ships. Occasionally movies are shown, regattas between crews are held, or inter-ship rendezvous are arranged. For over 100 years Sea Scouting has promoted better citizenship and improved members’ boating skills through instruction and practice in water safety, boating skills, outdoor, social, service experiences, and knowledge of our maritime heritage. Sea Scout units– called ships- are established all across the country on oceans, bays, rivers, and lakes. They provide limitless opportunities and exciting challenges that you won’t ﬁnd anywhere else. Sea Scouts is a place to grow and learn, ﬁnd adventure, and build long lasting friendships. A terrific message from Dawn Riley, undeniably one of our country’s best sailors and finest Ambassadors to the sport of sailing and our maritime traditions. 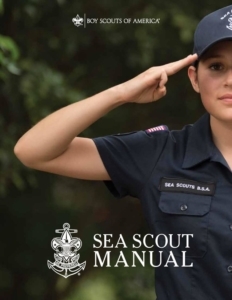 Known as the Boy Scouts’ best kept secret, here is the BSA with a wonderful overview of the Sea Scout program and goals. 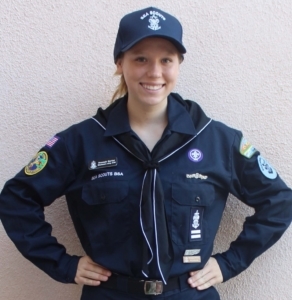 Listen to Hannah, our ’18-’19 Western Region Boatswain, tell you more about what to expect from the Sea Scouts. At the core of every success organization, or country for that matter, is a manual, a set of “to-dos” to follow. Having been in existence for over 100 years, the Sea Scouts have had the time to continually learn, then build upon their manual, and the end (current day) result is an excellent navigational guide for our Ship. Advancement is an important part of the Sea Scout experience. The experiences, located here, help Sea Scouts to set realistic goals to achieve rank, accomplish projects, and gain knowledge and understanding of the world around them.There are many opportunities for advancement in Sea Scouts. Included are the trails to Eagle and Quartermaster. Each of these trails is a highlight experience, but each requires the Sea Scout to set his (or her, in the case of the Quartermaster Award) own goals and follow through to achievement. The requirements for advancement were designed by Sea Scout youth to establish standards of performance for all Sea Scouts. Recognition is an important part of the Sea Scout experience. The experiences, found here in detail, help Sea Scouts to set realistic goals, accomplish projects, and gain knowledge and understanding of the world around them. Ship 3500 will be wearing the New Century Universal Uniform, found here, but with some modifications which have been made specifically for our desert environment. Wherever possible, our uniforms will be rip-stop material (shirts, shorts, and pants) because due to our heat, we will be going in and on the water at a moments notice, and we will need to dry off just a quickly. We are currently working with a few suppliers on discounted pricing and will have the details posted shortly.